An expanded edition of a celebrated book that travels throughout the African diaspora to savor the timeless joy of black cuisine and culture. A hidden gem by the author of For Colored Girls Who Have Considered Suicide/When the Rainbow Is Enuf, Some Sing, Some Cry, Sassafrass, Cypress & Indigo, and Betsey Brown, a delightfully eclectic tribute to black cuisine as a food of life that reflects the spirit and history of a people. This edition, with delectable illustrations, features additional recipes—including two vegan dishes—that connect the culinary past to the present and welcomes a new generation of readers. 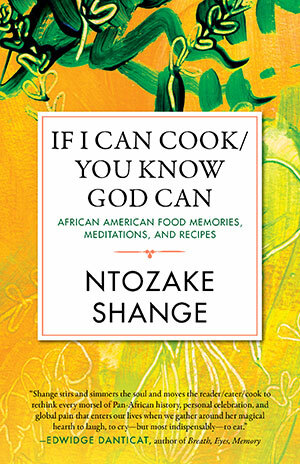 With recipes such as “Cousin Eddie’s Shark with Breadfruit” and “Collard Greens to Bring You Money,” Shange instructs us in the nuances of a cuisine born on the slave ships of the Middle Passage, spiced by the jazz of Duke Ellington, and shared by generations across the African diaspora. Rich with personal memories and historical insight, If I Can Cook/You Know God Can is a timeless story of the migration of a people and the cuisine that marks their living legacy and celebration of taste. Celebrating Black Women Writers reissues and revives Beacon Press’s previously published literary works by black women. The series uplifts exceptional work written by black women in honor of their stories, lives, and experiences throughout history and beyond. What’d You People Call That? What Is It We Really Harvestin’ Here? Westward Ho! Anywhere Must Be Better’n Here! Is That Why the Duke Had a Train of His Own? And What Did You Serve? Oh, No, You Did Not!